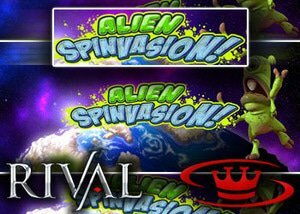 Rival Gaming accomplishes once again to impress its large following of fans with the release of Alien Spinvasion video slot. Rival enthusiast can now take part in saving the world from invasion from several platforms including desktop and mobile while the game is available for both free download and instant Flash play. The New Alien Spinvasion slot is created to inspire players to take part in spinning action based on an invasion from outer space usually part of storylines used in science fiction films. The main goal is to protect earth from the extraterrestrial invasion and weapons available to brave spin-participants include ray guns, alien eggs, meteorites, rockets and high card symbols. With brilliant graphics and excellent audio, Rival brought its personal touch to ensure an unforgettable playing session across 50 paylines offers on 5 fast paced action reels. The main alien goes wild and becomes sticky at times causing it to remains in the same position during spins until such time as a win is achieved, which hugely benefits players bankrolls. The army general is the scatter and has his finger on the trigger, once three or more generals meet across the reels the free spins round comes into play. The army general closely monitors this round as he expects alien ships to land any second on the reels. Once the free spins bonus round is activated everything changes as the drop symbols is now part of exciting play, and players get to witness as symbols part of a combination drops from the reels to make space for those hiding behind them resulting in additional winnings. Rival Gaming warns online players in advance to get ready for the gaming experience of a lifetime, since Alien Spinvasion will be available at all top Rival Casinos from the 13th of March 2017. The brand-new release is sure to be celebrated by lots of excellent offers, bonus handouts, and free spins. Vanguards Casino currently offers an astounding no deposit bonus worth $20 free. Register a new account today and enjoy the free $20 on any games of your choice, the no-deposit bonus is followed by a staggering 100% bonus worth up to $500 rewarding new members for making their first deposit. The generous $20 no deposit bonus can be enjoyed across all video slots and is exclusive to first-time users Games such as baccarat, Red Dog, roulette, progressive slots, and craps are excluded from play via the no deposit bonus. Vanguards Casino offers a wide range of slots games, welcomes US-based players, and the casino is one of the most popular entertainment destinations for variety-seekers. It's great selection of Rival titles ensure its place as an attractive hotspot for online gaming enthusiasts, and with the current $20 no deposit bonus players get to enjoy the Rival no deposit bonus on Alien Spinvasion video slot.